I still remember the copy of Alice in Wonderland. It was a paperback, red, with a torn cover. The cover had a pebbled effect which I thought felt interesting. I was very small, maybe three or four, and these things mattered. I had paged through the book often because I liked the pictures and I desperately wanted to know the story that went with them. I begged and begged my mom to read it aloud but she was a bit reluctant. She thought, understandably, that it was a little over my head and that I wouldn't have the patience to listen to it. Finally, I wore her down and she agreed it could be our next read-aloud book. To be honest, I don't remember much after that. Did I like Alice and her adventures? Did it live up to my expectations? I don't remember. What I do remember is the wanting, the desperate desire to know the story, the feeling that inside that book was something important. I think that is what all readers feel. That books hold secrets, they hold knowledge, they hold stories, and stories matter. Through our lives as readers, there are books that have an impact. That impact is not always because they are our favorite books or because they are meaningful books that teach us something but because they develop our reading life in some way. Little Women was another such book for me. It did become a great favorite but when I stumbled across it on my second-grade teacher's book table all I knew was here was a familiar story. I was horrified to realize that the copy I owned was a condensed version and I immediately knew that I had to read the whole thing. I had to argue with my teacher in order to convince her I could read it. This was totally out of character since I was a very shy, quiet child but it was necessary. I needed that book. It was the start of a life-long hatred of condensed books and a similarly life-long belief that children should be allowed to read what they want to read. Little Women also taught me that old books are full of great stories and that big books are worth the trouble. Sometimes it is not the story that pulls us in but the words. When I was just a bit older, maybe nine or ten, I pulled a copy of one of Shakespeare's plays off the bookshelf. I think it was The Taming of the Shrew. I didn't really intend to read it, I was just bored and convinced my mom was never going to get off the phone so I could ask her whatever absolutely necessary question I thought I had. So I picked up a book. I knew I wasn't following it all. I knew parts of the story were going over my head. But I also knew I liked the rhythm and flow of the language. I liked the sound of it even though I wasn't completely sure what it meant. I plowed through the whole thing feeling slightly confused but as if I was on the edge of something amazing. To be honest, that is still the feeling Shakespeare gives me. He taught me that words are not simply the vehicle for a story but also a source of beauty in their own right. Not all of my reading epiphanies occurred in my childhood. Just a few years ago, I discovered book blogs and, as a result, discovered One Fine Day by Mollie Panter-Downes. I love that book. It is lyrical in its writing, the story is quiet but enthralling, and it is set in England. What more could I ask for? That one book led me to Persephone Books which led to an expansion of my reading to British authors of the mid-twentieth century. 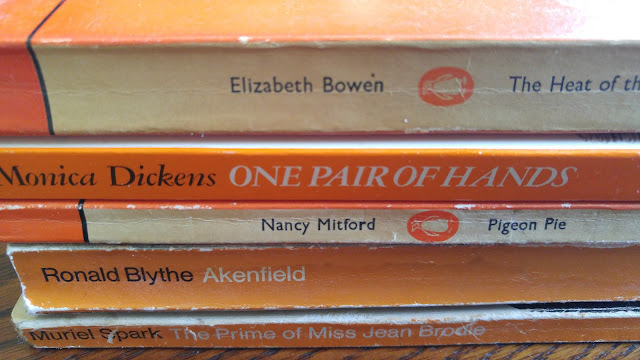 Authors like Dorothy Whipple, Monica Dickens, Elizabeth Bowen, and Elizabeth Taylor. Wonderful writers, all of them, but I probably would not have discovered them if I hadn't discovered Mollie Panter-Downes first. That is the amazing thing about books. They change us. And that never ends. Twenty or thirty years from now I will be able to look back and pinpoint more books that matter to me. More books that changed who I am as a reader. More books that I love. What books have developed you into the reader you are today? I've been thinking about this too and wrote a post about it a while ago. I love your story about The Taming of the Shrew. There were many books that called to me early on that I didn't fully understand at the time. That's part of what helps us develop as readers and human beings, that we experience something that attracts us mysteriously and have to grow to catch up with it. That is why I think children should be basically allowed to read what they want. I know I did not always fully comprehend the classic works I read as a child but they pulled me in. Every time we read a book we read it just a bit differently. Maybe I would have more fully appreciated those books if I had first approached them as an adult but I would have missed the mysterious attraction. I want to read "One Fine Day", but on my list I have to read "At Mrs Lippincote´s" first! Now I´m in "The Priory", by Whipple (it took 5 months to arrive here in Brazil --- so, as you can see, my list requires a lot of patience! ), I´m at page 52 and already in love with it. I thought that "The Light Years" (Elizabeth Jane Howard) would be a good book about the same "life" as The Priory, but I abandoned it at the beggining. Every sentence in a Whipple´s book is full of connection with her carachters, she is a master. There is no book in my childhood that made a powerfull impression. But in my adolescence I´ve read five times One Hundred Years of Solitude, three times Invisible Cities, and three times The Unbearable Lightness of the Being. I read At Mrs. Lippinocote's last year and loved it. I haven't read The Priory yet but every Whipple I have read has been fantastic. Five months is a long time to have to patiently (or not so patiently) wait for a book. I haven't read One Hundred Years of Solitude but any book that is read five times must have a lot to recommend it. I was always a keen reader, visiting the library every week, but one event stands out from I was about 12, when we were collecting stuff to burn on a bonfire. I was horrified when someone gave us books. Needless to say, these did not get burnt. They were probably the first adult books I read, and included my first romantic novel - a Barbara Cartland - and my first war story, fortunately very mild! It has always reminded me that we should be prepared to read outside our comfort zones. I am horrified at the idea of burning books as well. That is just wrong. I remember discovering Barbara Cartland novels at about the same age. I think I stumbled across them in the library. I kept expecting them to be more shocking than they were! I agree about reading outside our comfort zones. We can be pleasantly surprised if we do that. My first memory is probably of The Chalet School series by Elinor Brentwood Dyer, I think.Little Women definitely. Then Wind in the Willows and later Ring of Bright Water. Interestingly, after a long gap I now read loads of nature genre books. As a teenager I read Agatha Christie. Jane Eyre is probably my all time favourite. Since I have started reading blogs I have come across quite a few references to The Chalet School series but I never heard of them when I was a child. I went through a huge Agatha Christie phase as well.